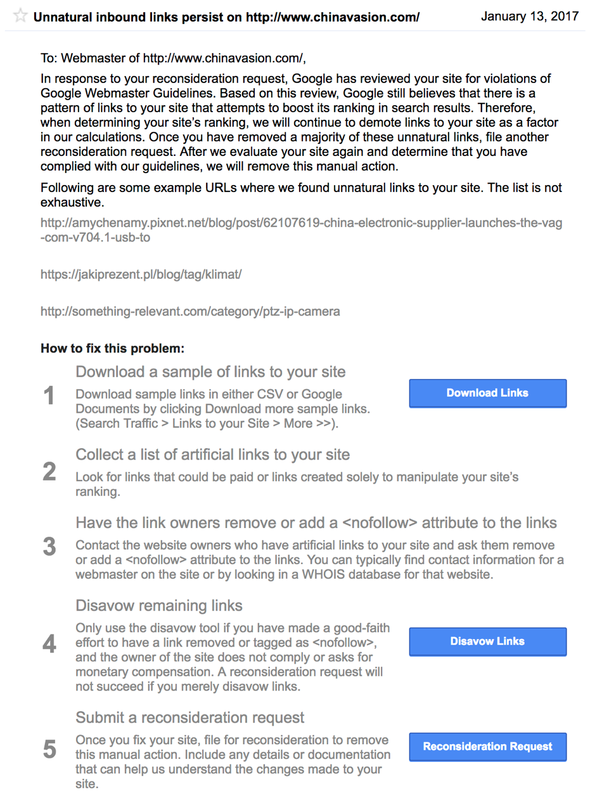 If you received an email from Google Search Console Team about unnatural inbound links that violate Google Webmaster Guidelines – then I know how you feel. It is definitely one of the worst messages you can get from Google because this means that they don’t like how your backlink portfolio looks and they are punishing you because of this. The damage to your website traffic might be big and severe. However, there’s definitely a way to fix this. Read on to find out how. What the heck is a Google Manual Penalty? From this, we can see how important is to rank on page 1 of Google search results. Page two is bad, let alone page 10 or 20. Online ad network Chitika did a research in which they found that page 1 results enjoy an astonishing 95% of all search traffic. It’s not hard to conclude why every website would want to be on the first page. BTW, the funniest reply to that joke above was “Or page 1 of Bing“… Anyway, let’s get back to the topic. Being first at something is usually considered a good thing. Both in real life and on the internet. However, this also carries a certain burden. Some people call this ‘the other side of the coin’. Of course, there are many advantages in being No.1 in some field, but people usually don’t pay attention to the disadvantages. In this post, I am going to talk about these disadvantages in the e-commerce industry. Or in plain English: why starting the first China-based webshop for selling items in small quantities led to a Google Manual Penalty. Bonus: Download the full version of this case study as PDF for easy print or offline reading! 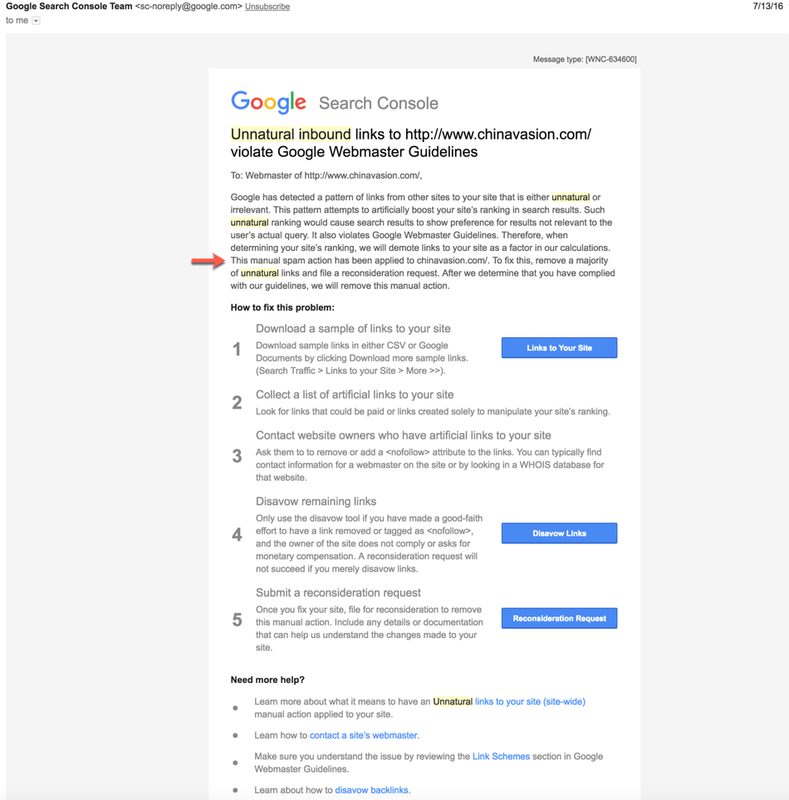 If you received an email from Google Search Console Team about unnatural inbound links that violate Google Webmaster Guidelines – then I know how you feel. I also know that you’re not feeling good and that you’re upset. Been there, done that. It is definitely one of the worst messages you can get from Google because this means that they don’t like how your backlink portfolio looks and basically, they are punishing you because of this. The damage to your website traffic might be big and severe. However, take a deep breath and try to control your temper. There’s a fix for that. It could be easy or it could be difficult. But don’t worry, there’s definitely a way to fix this. Read on to find out how. All this growth happened in just a few years. It skyrocketed. There are 2 reasons for this. First, the site was the first player on the market where you could buy 1 piece of some product. Of course it became wildly popular amongst consumers. 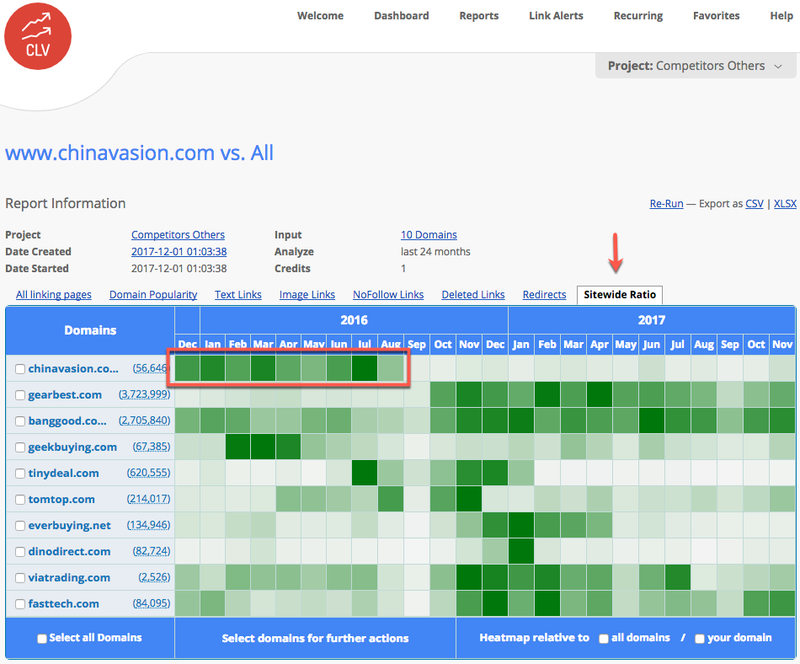 Many discussion boards and numerous websites started talking about Chinavasion because of this exclusive feature. Alibaba and other platforms had already started with their trading platforms but they operated in a rather traditional manner, where companies that were exporting goods were fully focused on big bulk orders – containers and bulk air freight. Second, link building tactics and search engine optimization, in general, were much much different from what they are today. The same as many SEOs at the time, the website owner and his marketing team had used link building techniques that were considered a good practice. Here I must accentuate that we’ve always used white hat SEO techniques. But as we all know, Google has changed. A lot. Also, a lot of websites changed for the better or worse. But their links stayed. Something that was OK and acceptable 10 years ago is now considered a definite no-no in Google’s eyes.That’s why constant checks of your backlinks are so important and why software like LinkResearchTools can help you a lot. But more on that later. 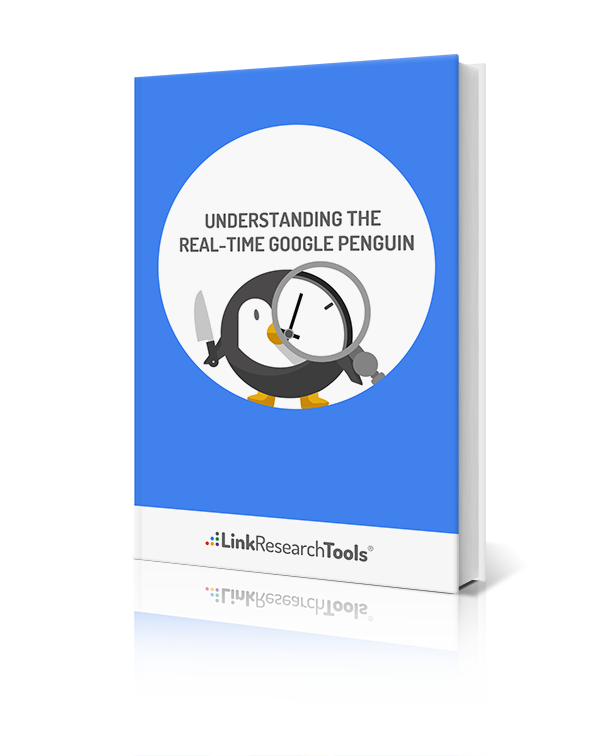 Google Penguin is a codename for a Google update that was first announced on April 24, 2012. The update is aimed at decreasing search engine rankings of websites that violate Google’s Webmaster Guidelines by using now declared black-hat SEO techniques involved in increasing artificially the ranking of a webpage by manipulating the number of links pointing to the page. Such tactics are commonly described as link schemes. 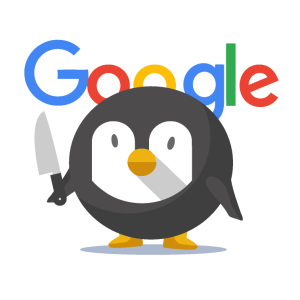 According to Google’s John Mueller, Google has announced all Google updates to the Penguin algorithm to the public. That’s what Google Penguin is in theory. But how does it look in practice? A picture is worth a thousand words. Please see below. Trust me, that hurts. Just for comparison purposes, it’s pretty much the same as losing wheels on your car but you are required to continue your journey. This happened to the whole internet, not just to one website. Since the year 2012, Google changed its search algorithm significantly, it changed the rules of SEO. 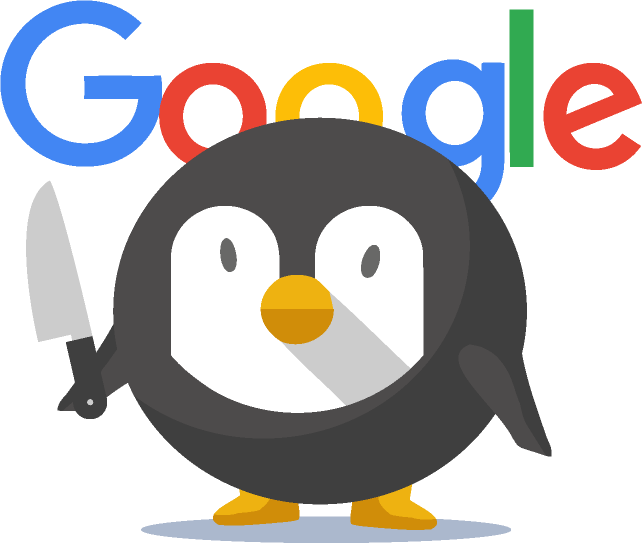 Google Penguin was the second great scare of the internet (first one was Y2k) – as Christoph C. Cemper calls it in his book Spaghetti Code: Detangling Life and Work with Programmer Wisdom. You can buy this book here. Highly recommended! Now you know what Google Penguin, that is, the automatic penalty does to every site on the internet. 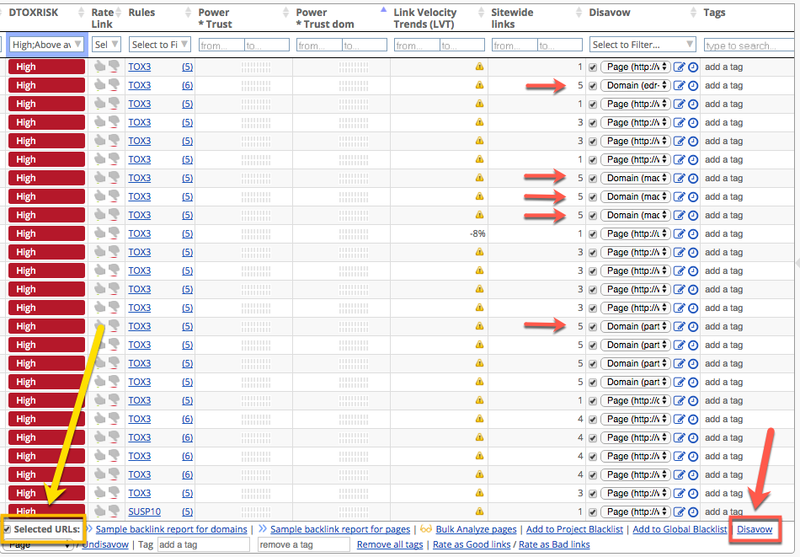 From this, you can easily conclude that getting a Google Manual Penalty is an even bigger punishment for your website. This is a sort of personalized penalty just for you. The Manual Actions report lists instances where a human reviewer has determined that pages on your site are not compliant with Google’s webmaster quality guidelines. Google’s algorithms can detect the vast majority of spam and demote it automatically; for the rest, we use human reviewers to manually review pages and flag them if they violate the guidelines. Flagged sites can be demoted or even removed entirely from Google search results. The Manual Actions page lists known issues on your site and provides information to help you address the problem. If your site’s ranking is affected by a manual spam action, we’ll also notify you by email and in the message center. The Manual Actions report lists manually detected issues with a page or site that are mostly attempts to manipulate our search index, but are not necessarily dangerous for users. Most issues reported here will result in pages or site being ranked lower or omitted from search results without any visual indication to the user. Meaning, they say that if they find any suspicious links to and on your site, they will either remove the site from Google search results or it will be significantly less visible in Google search results. Needless to say, this is not good. Let me show you what a manual penalty notification looks like. It isn’t pretty. I would argue that this is one of the worst nightmares for SEOs. Especially if you check your emails in the morning. It is not the nicest beginning of your day or week. As if constant struggle with Google Penguin wasn’t enough. When we got this notification about Manual Spam Action from the Search Console Team, we were surprised, angry, and anxious at the same time. But after this initial shock has passed, a feeling of helplessness started to emerge. Why? Simply because we soon realized that links which Google sent to us were only a sample of links that should be disavowed. They were not even close to the number of spam links that were in our backlink portfolio, and which needed to be removed. Let me put it this way: Google just doesn’t care and it surely isn’t interested in helping you to resolve this. Yes, they are nice enough to tell you about the penalty but after that – you’re on your own. It’s totally up to you to invest an effort and prove them that you are devoted to removing all the troublesome links. So, as Google suggested to us, we immediately started contacting the websites for which we thought might be spammy asking them to remove our link from their pages. We have used several SEO tools that claimed can help us in discovering websites with toxic links. However, we kept receiving emails from Google that there are some more links that needed to be removed. Allegedly one must show some endeavor on contacting pages in question in order to show devotion to removing toxic links. Soon enough we’ve realized that this process is too slow and inefficient. For some websites, we couldn’t find any contact details. The webmasters of some websites didn’t respond at all. For some websites, webmasters required cash payments in order to remove the link… and the list goes on. We’ve faced all kinds of problems in this process. I’m not sure if this is because we are an e-commerce company and by default people think that we have loads of cash to throw away in order to make some space in our money warehouses where we keep tons and tons of 100 dollar banknotes and we’re constantly running out of storage every day… Anyway, I can say that we were a little bit irritated because of this. Just a LITTLE bit. But somewhere at the end of 2016, we discovered LinkResearchTools and their awesome tool called Link Detox. This helped us immensely in removing this nasty penalty. 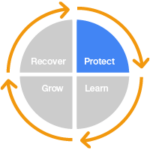 Below you can read how this process was achieved and what steps we took to recover from the Google penalty. Just before we jump onto detailed explanation on how to remove the penalty, I’d like to show you another possible reason why our website was punished with this penalty. We believe this was due to Negative SEO Attack. One of the LRT tools that can help you to better understand and outperform your competition has shown us something very interesting. This tool is called Competitive Link Velocity (CLV) and amongst other things, it can tell you how many new inbound links your website (and your competitors) earned in a certain time frame. In the image below you can see that between December 2015 and July 2016 an unusually large number of new text links appeared, pointing towards our website. Competitors websites also got some new links but we were getting loads of links month by month consecutively, nonstop for almost 7 months. We did NOT have any link building campaigns at that time that could have caused this. That I can claim with certainty. 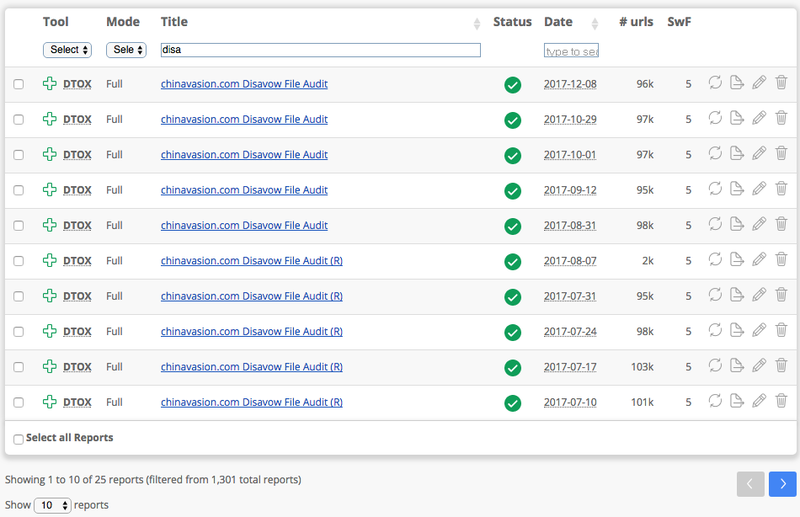 Another interesting metric that CLV report can show you is the sitewide ratio of the links you’re getting. A sitewide link is one that appears on most or all of a website’s pages. Sitewide links are usually considered as spammy, those are links from blog or forum footers etc. Later we found many backlinks from some irrelevant domains like “forex trading” and “gambling”. Below you can see the sitewide ratio of our domain. So… somehow a large number of sitewide links have appeared in our backlink portfolio. We haven’t determined – nor we can determine who and how these links were created. The major moral of this story is that you should be looking at your backlinks on regular, weekly basis in order to avoid any possibility of Google Penalty. Checking your backlinks should be like a regular maintenance of your website. The same way you backup your data, you should keep your backlinks clean and tidy. 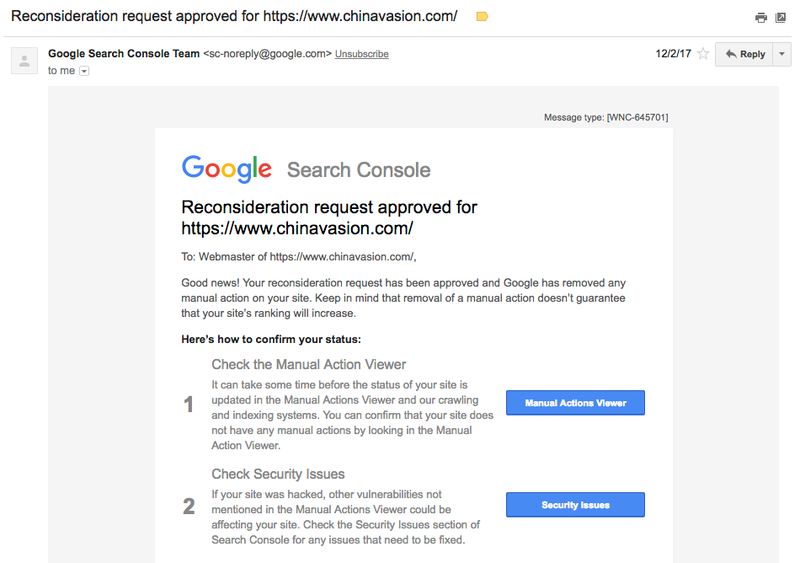 If you pay close attention to what Google Search Console Team said in their notification email, you will notice that they recommend removing a majority of unnatural links and filing a reconsideration request. That word “majority” is a very interesting word here. They don’t even say how many links there are for removal let alone sending the list of those URLs. This means that you have to figure out this by yourself. Many people would argue that this is not fair but… That’s completely different topic. Luckily there are some tools online which can help you with this. I already mentioned one of the best (according to my personal experience) called LinkResearchTools. 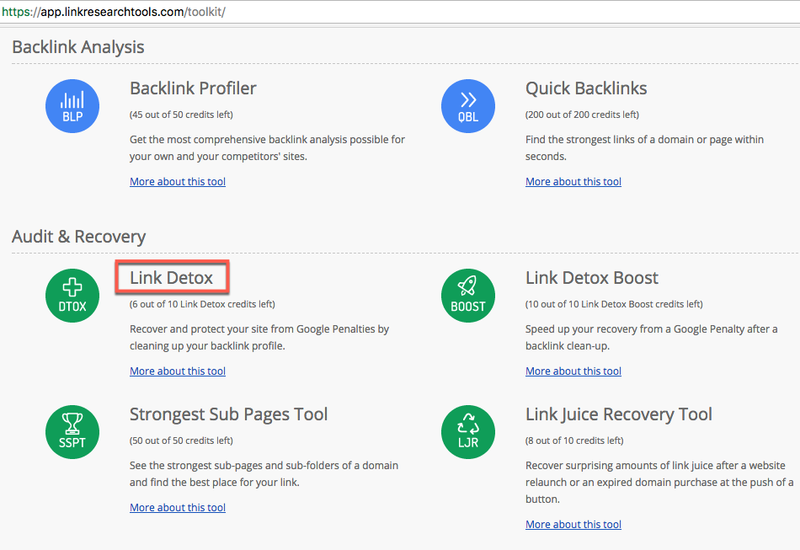 They have many amazing tools for all sorts of SEO tasks but this time I am going to talk about Link Detox because this tool can help you to remove any manual actions that Google gave to your website. The Link Detox uses 25 link data sources and offers 97 metrics which can help you to better understand what’s going on with your backlink portfolio. Obviously, the first thing you have to do is to run a DTOX report. After you login to your LRT dashboard, you will find it under the Audit & Recovery section. Please see below. Now, I am not going into detailed explanations of these quoted items because you will have all the explanations on the report creation page itself. Their knowledge base is also very detailed and helpful. Also, you can always reach out for help by contacting their support team. When you have selected all the desired options, just click “Run Link Detox” and you’re good to go. After you hit that button the report will process, waiting time for finishing the report varies depending on the number of backlinks for the domain in question. The more links, the longer the waiting time. 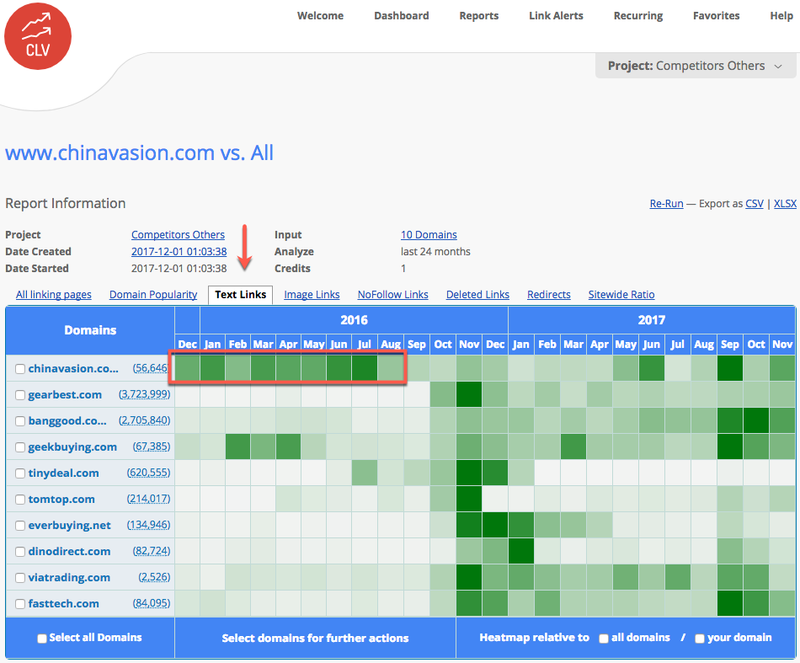 For instance, chinavasion.com has around 6.3 million links. That’s a LOT of links. Try to put that in an Excel spreadsheet and do all the filtering manually. No can do. No way Jose. If your backlink portfolio consists of several million links, then prepare yourself for a bit longer waiting time. Reprocessing such a large amount of links isn’t a trivial task. It takes time and CPU power. Usually, I was waiting between 3 and 5 hours for this task to be finished. 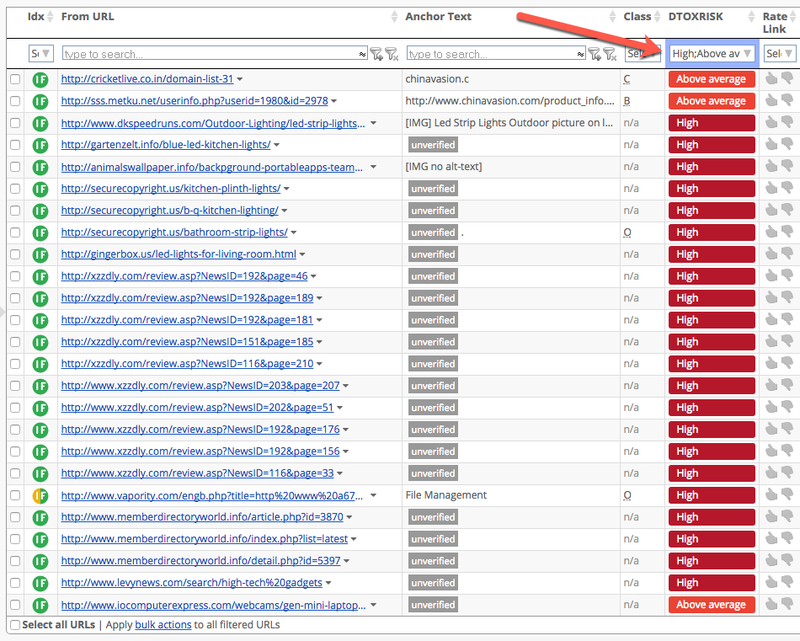 Another cool feature of the DTOX report is showing you the level of your Domain-wide Link Detox Risk. This is especially useful for having a brief glance overview of your complete backlink portfolio and for determining the course of action that should be undertaken. After running our first Link Detox report, our DTOXRISK was high and appeared in red. This report needs to recalculate risk levels because important aspects like keyword classification, new links, new ratings changed and the DTOXRISK® shown could not be trusted. Recalculation does only take a few minutes and will not cost you extra credits or quota. 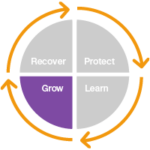 Below is the Distribution of Link Detox Risk® (DTOXRISK®) ratings in Link Profile. It looked like this in our first DTOX report. Not very good, you’ll agree. We had to review and potentially disavow around 11 thousand backlinks.This overview is useful for 2 reasons: it gives you a shortcut to see highly toxic links instantly and it offers an overview of your progress i.e. how many links still need to be evaluated and disavowed and so forth. In order to save you some time, LRT created Filter Slices feature. This is basically a shortcut or sort of a bookmark which helps you to save your filters for later, that is if you want to see only certain kinds of links you can quickly filter the data to only show those. Now, after I explained all the major options you need to be aware of (in order to start working on your links) I am going to show you what I did to remove the bad links. When you click on “Show me these links” text in that table mentioned above, Link Detox will filter out toxic links automatically and prepare them for you to review them, just like in the table below. More precisely, it will only select links with High and Above Average DTOXRISK. After selecting links with High and Above Average DTOXRISK, I would usually do some more filtering in order to get the most toxic links first and to deal with them as fast as possible. Simply because they are jeopardizing our domain the most and we want to disavow them ASAP.These additional filtering rules were to filter out TOX1, TOX2, and TOX3 links. More explanations about DTOX rules you can find on Link Detox Rules page. For example, TOX1 would mean that domain is not indexed in Google which is often a sign of a Penalty. TOX2 means that Linking domain’s theme is listed as dangerous – malware or virus. TOX3 means that DTOXRISK score for this link calculated is classified as unnatural by the Link Detox Genesis algorithm. Next round of filtering would be to sort Power*Trust dom ascending. This means that I am only looking at websites that are very weak and don’t pass any link juice or pass the low amount of link juice. You don’t need those kinds of websites. 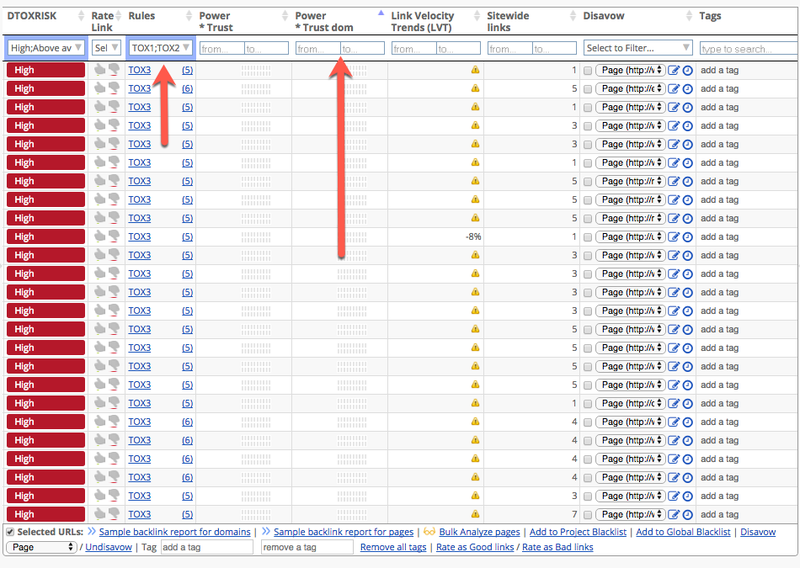 Even if you check the domain age column on the right, you will see that those are mainly non-indexed pages. 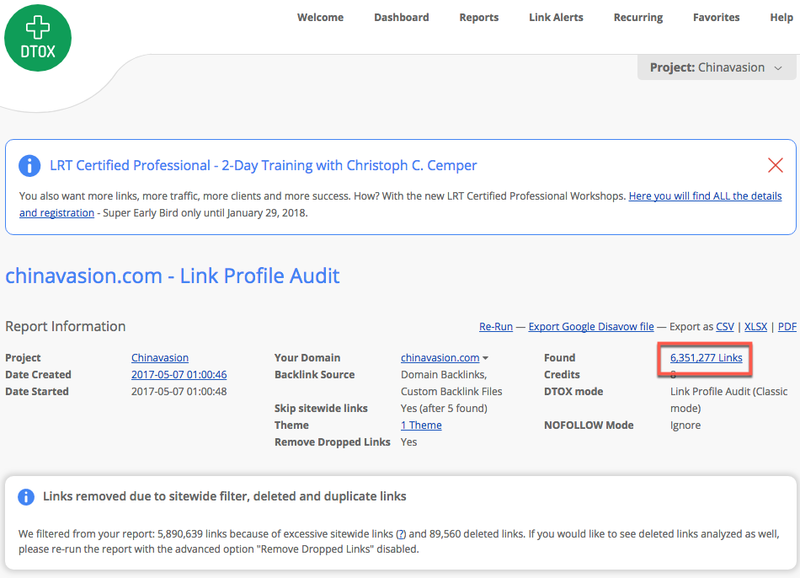 After I did all the filtering, the next step was to select all the links by clicking the checkbox at the bottom left of the page and then additional options appear like sample backlink report, bulk analyze pages, add to project blacklist etc. But the one I am interested in the most is the disavow link. When I click on this link, all the previously selected pages will be marked as disavowed in one click of a mouse! How cool is that, huh?! The default setting is to disavow pages. However, sometimes I would need to disavow the whole domain because of sitewide links. This is also as easy as pie, I just need to click on a drop-down menu in the Disavow column and select to disavow a domain and that’s it. In case I need to have a quick look of a page in order to decide whether to disavow it or not, I just click on Link Detox Screener button and I am offered a quick preview of a page in question. And I was repeating this process until I removed all the links / domains that had High and Above Average DTOXRISK. Of course, I couldn’t remove all the links at once and in the first attempt because there were too many of them. So, after disavowing in LRT, I had to recalculate the DTOXRISK and then upload the file to Google Search Console. Also, there were some new links that were appearing and LRT software was discovering new ones all the time. The last step in this part of the process was to export a Google Disavow file. The data is being downloaded in a correct format and can be directly uploaded to the Google Search Console. The format is designed for the Google Disavow tool, but some text editors cannot display them correctly. The suggestion is not to open the file in the Notepad, but to use Wordpad for the correct layout. By the way, this is how it looks when Google rejects your reconsideration request. After receiving these emails, I wasn’t very happy but all I could do was to continue with the process of examination and disavowing of bad links. Unfortunately, at first, I didn’t know that Google doesn’t process the disavow file automatically. And because of this, I wasted some valuable time waiting for something to happen. And yes, it’s frustrating to play the waiting game with Google! Luckily, I discovered Link Detox Boost! According to LRT knowledgebase, this handy tool forces the Googlebot to come around and crawl the bad links I have already disavowed, and values the Disavow command knowing what links not to count towards your site anymore. 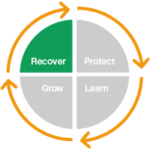 You can see the detailed explanation on how to start a new Link Detox Boost report at this link. It’s pretty straightforward and no need for me to say anything additional. Except it’s a lifesaver! After repeating the above-described process over and over again, for more than a year, we have finally got rid of the Penalty. This was a very happy moment! When I saw on my phone a new email from Google in the morning I started to sing. Literally. My wife thought that I’ve lost my mind, finally. But I was really happy! This is how it looks when Google approves your reconsideration request. Woo Hoo! 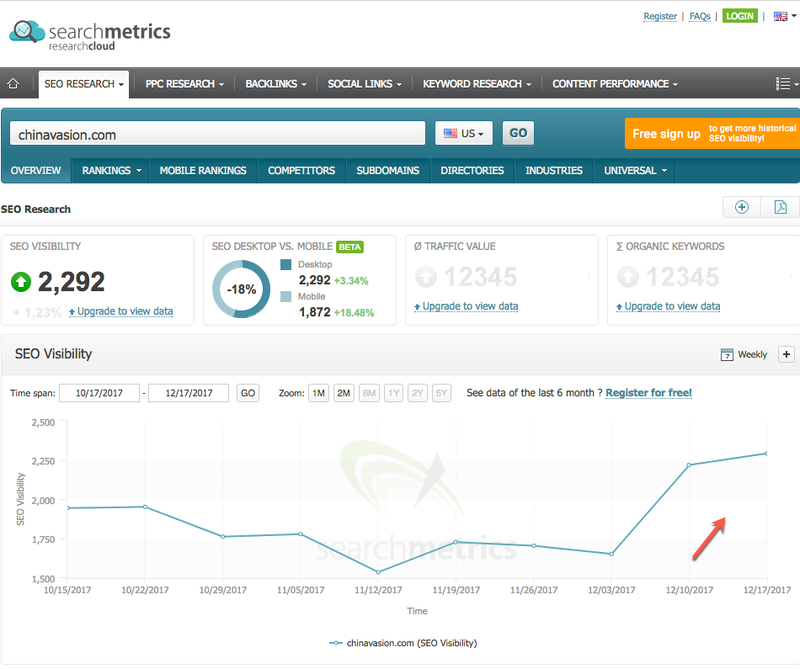 Even though they don’t guarantee any improvements in rankings or search results (SERP), we have experienced a slight boost in SEO visibility after this Penalty was removed. You can see that in the image below. 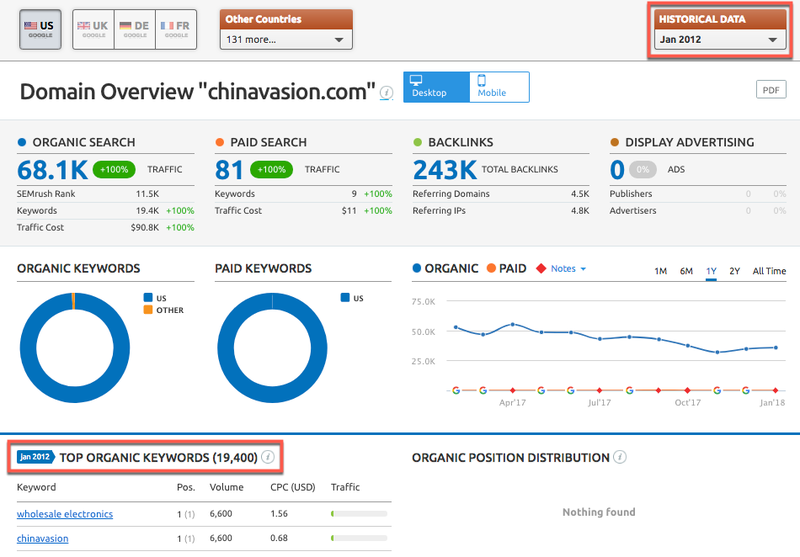 And what is SEO visibility anyway? SEO visibility is a metric that tells you what percentage of all possible organic clicks (from SERPs) a website is getting for a given keyword. This is a metric compiled from several relevant search factors that are used to calculate how visible a website is in a search engine’s organic results. In other words, SEO visibility is not to be understood in terms of raw traffic numbers, but rather your position in the SERPs themselves in relation to your competitors. Checking your disavowed links from time to time is highly recommended practice. Why? Because just as your website changes its SEO visibility, Power and Trust – the same goes for other websites. 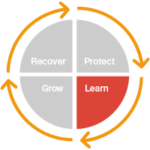 Meaning, after some time, those websites that had High and Above Average DTOXRISK could recover and they could provide you with some useful link juice again. This is why it’s important to re-examine your disavow file and see if there are any good backlinks in it and un-disavow those kinds of links. This also could be one of the fastest ways to do link building, since your link already appears on those sites. To use it, you only need to select the second option while starting a Link Detox report. I also do this process regularly for our website because we rejected about 30% of the backlinks that we had. For example, you can also set the report to refresh weekly. This article will tell you how to do it. If you check your backlink profile on regular, weekly basis – then you don’t have to be worried about any Google Penalty. It is as simple as that. Checking your backlinks portfolio should become a necessity for every website. Just like you do regular backups of your data, or just like your accountant does your business books. Imagine if you skip a few months of tracking your invoices and expenses. I am sure we all know where that would lead. After several months, we could have some issues with authorities and with paying taxes – in the best case scenario. The same goes for Google. If we don’t pay attention to our backlinks, Google will behave like some kind of tax inspector and will punish us for not taking care of them. Therefore, I highly highly highly recommend you to take care of your backlinks before it’s too late and before you receive an email about the penalty. 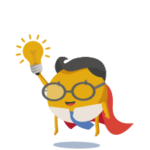 The LRT Superhero Startup Plan includes all our 25 link data sources and allows you to perform link analysis and monitoring, SEO competitor research, Google recovery and link building for your own or your competitor's sites. You get your website's complete backlink profile recrawled and enriched with all SEO metrics you can dream about for your analysis. This makes all the difference. 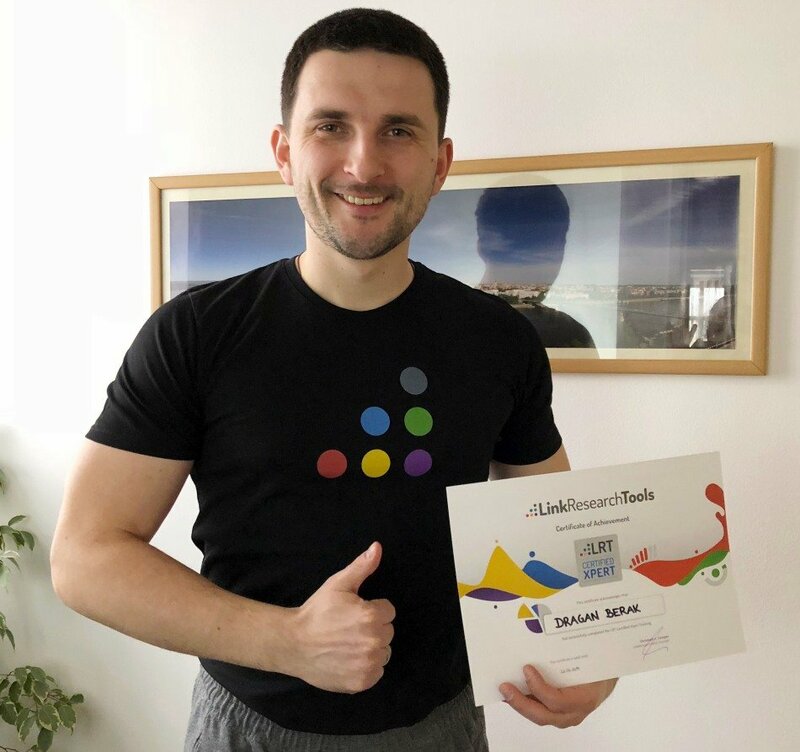 This case study was written by Dragan Berak - SEO Consultant, Online Marketing Specialist, and proud user of LinkResearchTools and Link Detox. 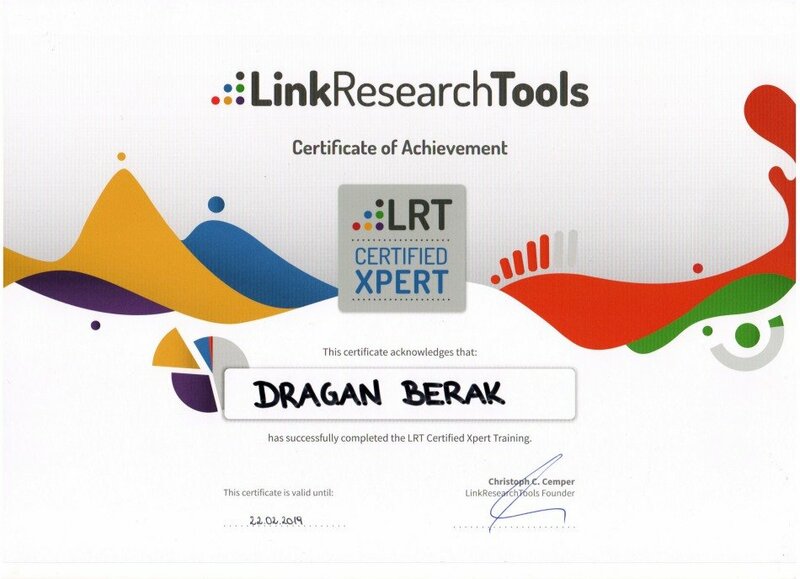 Dragan is also our new Certified LRT Expert. Dragan Berak is the Lead SEO at Chinavasion Ltd. - an e-commerce company which is selling all kinds of electronics and gadgets. He's a tech junkie, marketing geek, and gadgets nerd. In the world of digital marketing since 2010 but in 2014 started learning about SEO and didn't stop ever since. Dragan is also a specialist for SMM, SEM and affiliate marketing but his great love was and still is SEO.